Remember when Ally McBeal gets herself a theme tune? Whenever she goes, when she needs a boost, she hears her song in her head and off she goes. Well now, I’ve found mine. 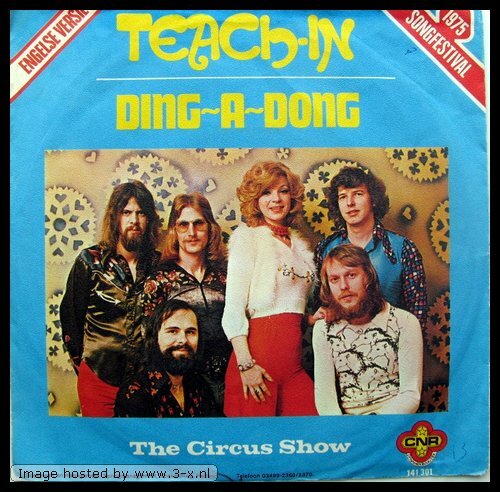 A couple of weeks ago the ace #1 Hits From Another Planet posted The Netherlands winning entry from the 1975 Eurovision Song Contest – Teach In with Ding A Dong. Still remaining as the last time Netherlands won the contest, it beat the UK entry (The Shadows – Let Me Be The One) into our very favourite 2nd place by 14 points. What’s more, Teach In were the first act to perform on the night, the first winners under the 12, 10, 8 – 1 point system and only the 2nd band to win the contest. They also hold a special place, holding the title in the year between ABBA and the UK’s Brotherhood of Man wins. Even when your lover is gone, gone, gone" then you’ve got no soul. Watch the final moments of Eurovision 1975 and marvel at how slow it is, fast forward a bit and watch them reprise their winning song. I never really used to like Amy Winehouse, but some how she’s managed to produce what is perhaps* my favourite album of 2006. When she first came out I probably didn’t actually even listen to her, I just foolishly dismissed her as akin to Melua and the like, but now, oh my god, she’s amazing. Nazza and I went down to the ever-pleasant Koko in Camden a couple of weeks to check her out live. We’d both seen her before in first album days – she played at my amazing graduation ball alongside The Scissor Sisters, Spooks, and Ash – but I don’t think I paid any attention. This time, I was a bit worried she might show up too drunk to sing, but I was wrong, and she totally delivered. "With lead single Rehab blasting its way into the charts, Mark Ronson’s production has added a glamorous hip-hop beat to most of her Motown-inspired numbers and never is this more obvious than on the glorious second single, You Know I’m No Good, sounding here more Brooklyn than Camden. Title track, the dark Back to Black is undoubtedly the jewel in the album’s crown with its melancholy, staccato piano transporting you to a smoky, dingy soul club in the 60s, the kind that none of us are old enough to actually remember." I cheekily think my original copy is slightly better than the slightly edited version but still, go read the rest of it at the lovely BBC London. 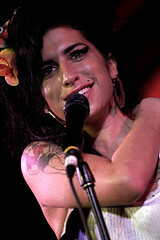 I might start hanging out more in Camden, I want Amy to be my Chanukah drinking buddy. A lot of people have slagged off Robbie’s Rudebox album, but I’ll happily say it’s one of my favourite albums of the year. It’s hard to go wrong really when you’ve got both the Pet Shop Boys and Mark Ronson working on it.